Description: Colonies club-shaped with a well-defined stalk and head. 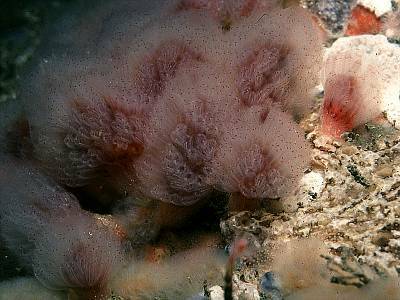 Usually several stalked colonies arise from an encrusting base. The test is transparent and greyish in colour, the stalk is often encrusted with sand. The individual zooids have four small red spots at the top of the branchial basket, and sometimes a splash of white pigment as well. They are arranged in small groups in the head of the colony, so that there is an appearance of darker grooves dividing the head into segments. The stalk is usually red, and this colour tints the centre of the colony. 30mm tall x 10-20mm diameter. Habitat: Prefers areas with moderate to strong water movement, usually in the shallow infralittoral, often under overhangs or on vertical rock faces. Distribution: Apparently a western and southern form in the British Isles. Records from eastern Scotland and eastern England would be interesting. Similar Species: The stalked colonies are similar to those of Aplidium punctum. 4 orange spots around top of each zooid. Dark grooves in head of colony. Picton, B.E. & Morrow, C.C. (2016). Morchellium argus (Milne-Edwards, 1841). [In] Encyclopedia of Marine Life of Britain and Ireland.